Rose Coschignano/Staff Photographer Senior guard Timmy Rose scored a season-high 12 points on 4-for-5 shooting in a dominant victory for BU over Hartwick. Coming off a loss to Army, the Binghamton men’s basketball team channeled some stored-up energy in order to not only claim a win against Hartwick, 89-70, but also have five players score in double-digits. Freshman guard Sam Sessoms led the Bearcats (3-5) with 17 points, and senior forward Caleb Stewart was right behind Sessoms with a season-high of 16 points. Twelve of Stewart’s 16 points came from 3-pointers, showing 80 percent accuracy on that front. Graduate student forward Chancellor Barnard was next in total points, coming in with 13, including one dunk in the second half. Barnard also led the team in rebounds with 10. The two other double-digit scorers, senior guards Timmy Rose and Everson Davis, had 12 and 10 points, respectively, a season-high for both players. Prior to the game against Hartwick (4-3), Davis’ season-high was three points, which came against Misericordia. Davis showed a significant improvement this game, reminiscent of his previous seasons on the team. Even though several players had season-best performances, not every player was riding that wave. Most notably, graduate student guard J.C. Show came away with only seven points, slightly lower than his 11.3 points per game. Show, however, was 100 percent accurate on free throws and had one steal in the first half. While the Bearcats were able to put on a notable performance offensively, the team struggled on defense, allowing Hartwick to make 15 3-pointers throughout the contest, which accounted for 45 of the Hawks’ 70 points. The Bearcats were ultimately playing a three-man team, as Hartwick’s sophomore guard Pat Garey, junior forward Kyle Bradshaw and sophomore guard Tommy Kelly combined scored 50 of the team’s 70 points. Garey, a native of Johnson City, cashed in on all five of his attempted 3-pointers, showing up BU from downtown. The Bearcats were much more accurate on free throws than they have been in the recent past. Last game, the Bearcats were only able to make one of six free throws, but this time around they were able to make 13 of 16 free throws, with six of those points coming from Sessoms. 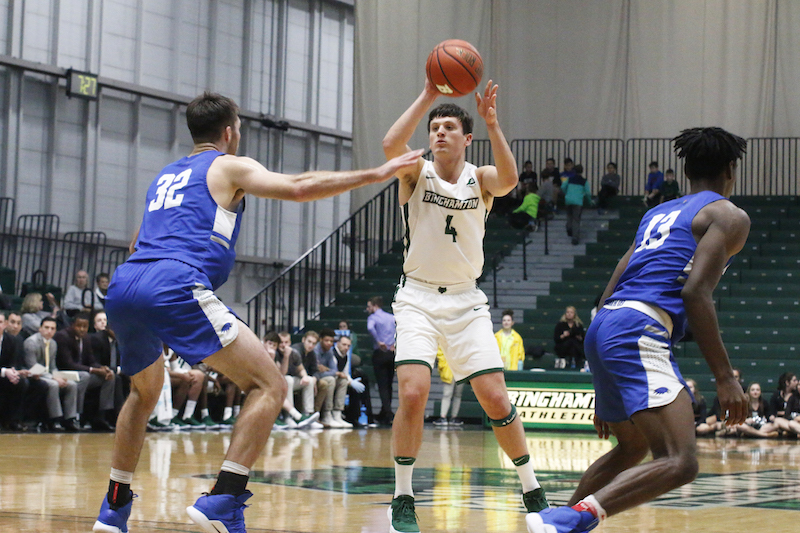 With this 19-point win against Hartwick, the Binghamton men’s basketball team is looking to secure its fourth victory Wednesday in Baltimore, Maryland as the team faces Morgan State University. Tipoff is scheduled for 7 p.m. from Talmadge L. Hill Field House.